According to last week's Bloomberg survey of U.S. manufacturers, industrial production at factories climbed by 0.2 percent month-on-month for September, while capacity utilization rose to 75.4 percent, up 0.1 percent. It's the third time in four months that production of consumer goods and construction materials has risen. "The drag from falling energy investment has abated," says Ryan Wang, an economist at HSBC Securities USA Inc., quoted here in a Bloomberg press release. "That should allow overall business investment to resume modest growth in the year ahead." The Venetian Hotel, November 14, 2016, 8:00 a.m. - 8:30 p.m.
Versatility’s NEW VT-41000 Laser Cabinet provides safe, secure and organized storage for laser lenses, laser nozzles, laser accessories and cleaning supplies. Manufactured in the USA by Versatility Professional Tool Storage. Versatility also manufactures a complete line of cabinets and carts for press brake and punching tools. 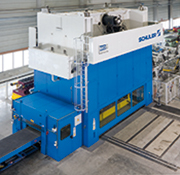 An article in 3D Metal Printing magazine describes how Fabrisonic, housed within the confines of EWI near the campus of Ohio State University, Columbus, OH, employs ultrasonic additive manufacturing (UAM) to bond strips of metal foil to custom-build new types of materials. An example of such a product being made using UAM: critical electronic components that provide radiation shielding, by layering tantalum and Type 6061 aluminum to create one monolithic panel. The machine used by Fabrisonic is additive-subtractive. At any time throughout the 3D metal-printing process, it can stop and machine in a groove or passage, and either insert a device (a sensor, for example) into the groove or just weld over the passage. Cincinnati Incorporated (CI), manufacturer of fiber and CO2 lasers, automation, press brakes, shears, powered metal presses, and additive manufacturing machines, will exhibiting at FABTECH 2016 (November 16-18, Las Vegas, NV). CI booth will be located in booth C31102 in the Central Hall of the Las Vegas Convention Center. The exhibit will feature the company's latest product lines—the CL-960 fiber laser with air assist cutting, the MAXFORM high-speed hydraulic press brake, the portable GOFORM electric press brake, and the newly released 3D printer—SAAM (Small Area Additive Manufacturing). 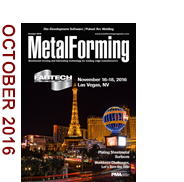 ...to support the desire of metalformers to do more work--and more complex work--in the die, and avoid costly secondary operations. Design and simulation software increasingly is the tool die shops use to meet the needs of their stamper customers; here's one shining example. A Minnesota maker of aftermarket parts for snowmobiles cut production time by more than 50 percent by switching to wave-pulse gas-metal-arc welding. See also: Schuler Incorporated, Hilma Div. of Carr Lane Roemheld, Versatility Tool Works & Mfg., PFA, Inc., Ross Technology Corporation, Cincinnati Inc.